The campus community has been informally introduced to the new Heat mascot over the past month, but this fiery addition to the campus is still without a proper name. Plenty of ideas have been floated, but what The Heat would like is for everyone on campus to help build this new character by submitting name ideas at any Heat weekend home game between January 11 and 26. Everyone who submits a name at will be entered in a prize draw. 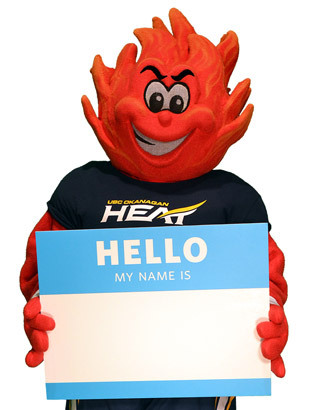 All name suggestions must be made in-person at any Heat weekend home game between January 11 and 26. To find out more, friend Ogi Ogopogo on Facebook or tweet the Heat at #nametheflame. Name of new mascot show be "Heatwave"